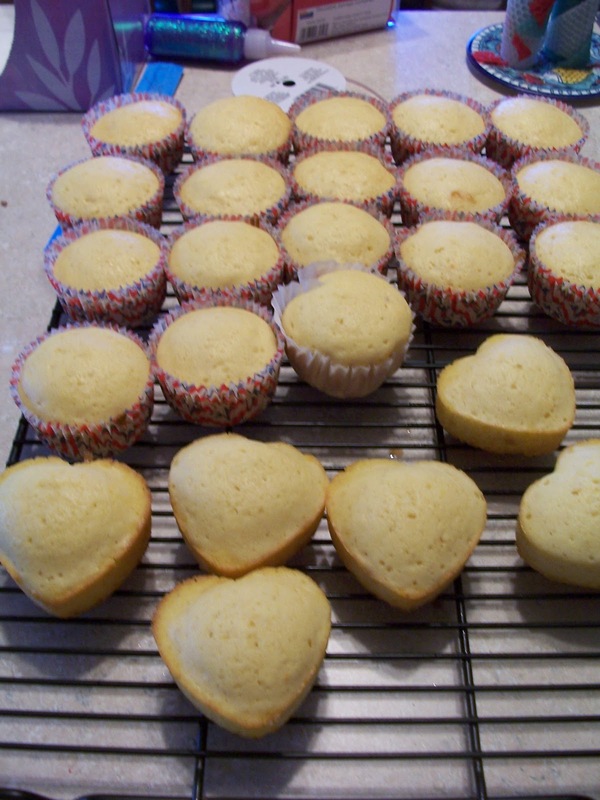 Yesterday was my dear husband's birthday, so Hazel and I baked cupcakes. 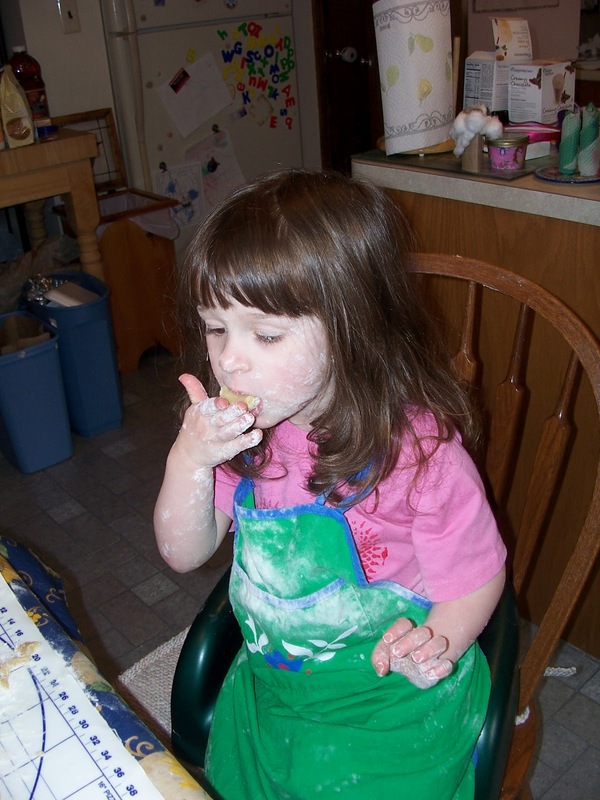 However we did not have time to make frosting, but had some leftover from some time and frosted a few to bring with Hazel to Nonni's (Steve's mother) so when Steve picked her up they could all celebrate. We left a few at home for Steve to eat throughout the day or at dinner (I was working through dinner, so I wasn't here to celebrate). 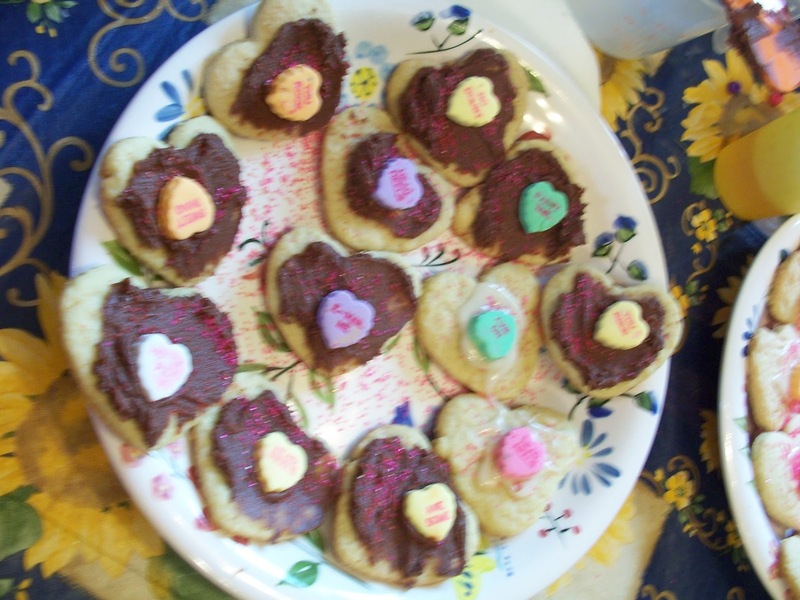 Then left the rest to frost with homemade frosting for Valentine's Day. Then I got to thinking, I remembered Homespun With Love shared a Valentine's Tea and Cookies a couple of Saturdays ago at Sharing Saturday. I also am running a meeting tonight at church for the Stewardship Ministry. We picked Valentine's Day because no one else would touch it for meetings, however it looks like it will be a small turn-out. Anyway, I figured we could make some cookies (I still had a cookie mix from Christmas sales) and I could bring a few cookies and cupcakes to my meeting and we could also plan a tea party. Hazel loved the idea and so did Steve. 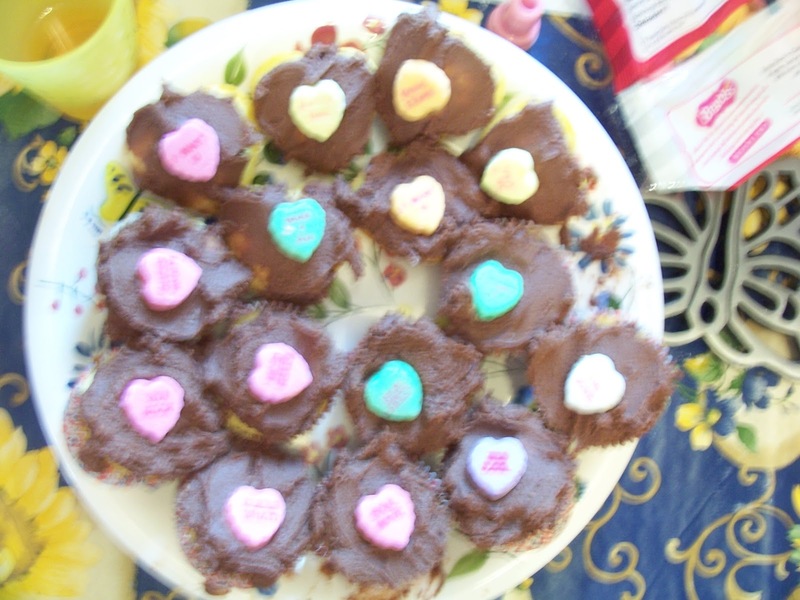 We cheated a bit with the cupcakes and used a cake mix. 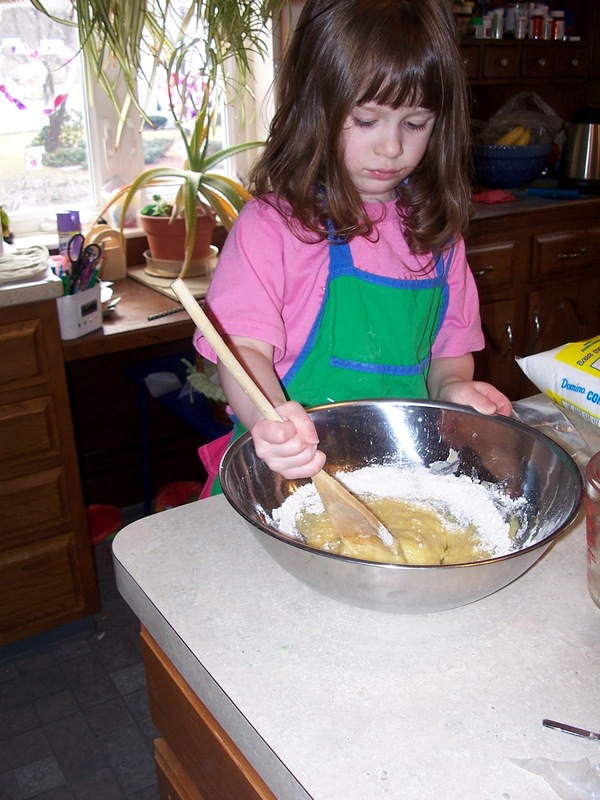 However, we made it low fat by using the changes I found at About.com Busy Cooks. It uses egg whites (though Hazel did get a bit of yolk in with the egg she broke), applesauce, water, and flour with a yellow cake mix (instead of the oil and full eggs). If you are making cupcakes like we did, I highly recommend not using paper cup liners. They stick to them since they do not have the fat in them. They came out delicious and we all enjoyed them. I didn't take any pictures of the few we frosted with the cheating frosting. I did cut a flower out of the top and try to frost just in the hole. They came out cute with a bit of practice. There aren't any cookies in here? 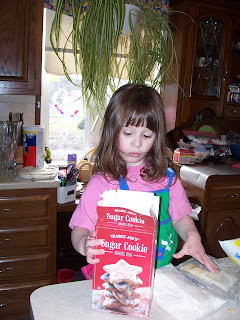 Then today we made the cookie dough. 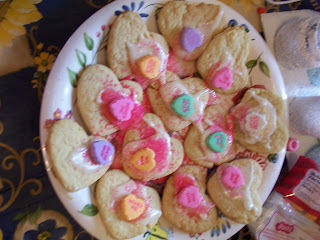 We cheated again and used our last box of Trader Joe's Sugar Cookie mix. Hazel saw the cookies on the box and wanted to open it herself. She was a bit surprised to pull out a plastic bag of powder and one of icing and foil wrappers. I believe her direct quote was, "There aren't any cookies in here? What is this?" 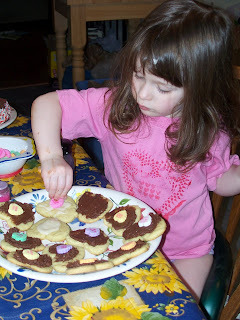 I let her do a lot with these cookies. I melted the butter first so the mixing was pretty easy and she did it. Then when it got harder I took over and then we had to use are hands (as instructed on the box) and of course she wanted to try. 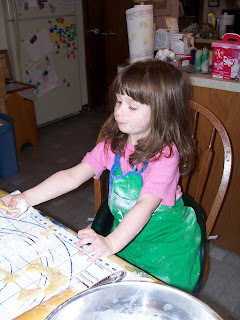 Then it was time to roll out the dough. 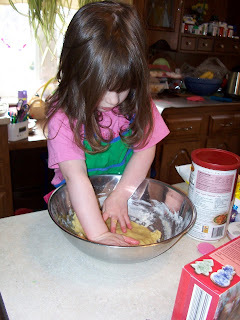 She helped and helped with the cookie cutter. We are still working on her placement of cookie cutters, but she is getting it. Then she remembered tasting the cookie dough last time. We ate the scraps after we had two pans worth of cookies. Somehow she got flour all over her. I'm glad we put her apron on first. After baking the cookies, we made some frosting. We wanted to make a chocolate frosting. I found a chocolate buttercream frosting that I had all the ingredients for at Savory Sweet Life. I cut the recipe in half since we only had half the cupcakes to still frost. It came out delicious. 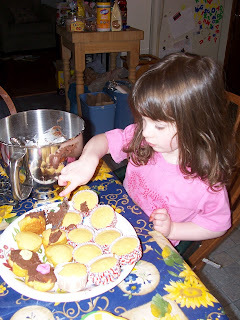 Hazel helped me frost the cupcakes. She did tell me it was hard to do. We also had picked up some Conversation Hearts to put on top. Then we started to ice and decorate the cookies. I always find the icing packet is not enough for all the cookies. 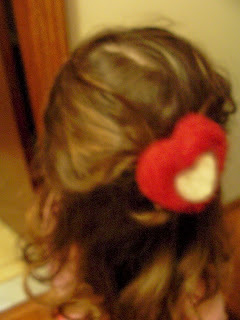 Maybe I put it on too thickly. So I always need some more frosting and we used the leftover buttercream for it. I iced and Hazel decorated. She had fun with the candies and the sprinkles. 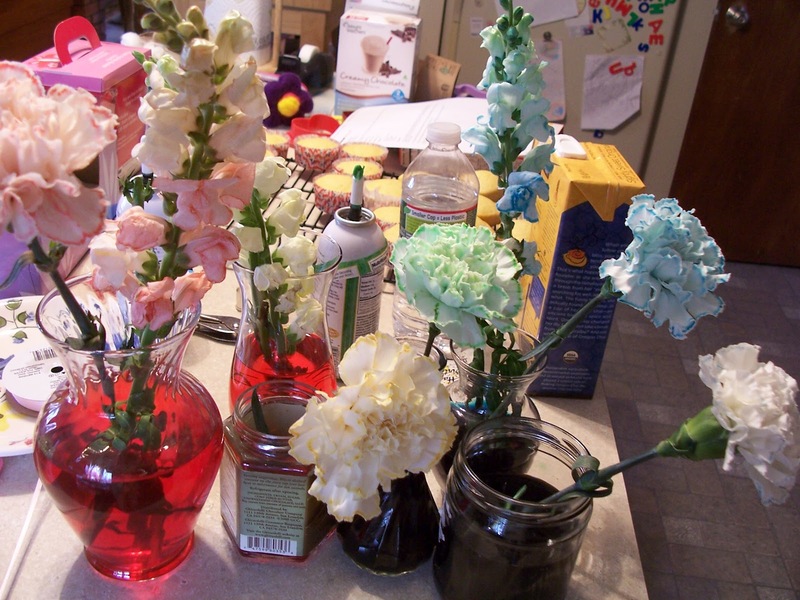 She wanted me to get the green sugar out as well as the red, but I explained to her that the colors for Valentine's Day were red and pink (and luckily had some pink sugar) and that Christmas colors were red and green. Then we did some clean up and stalling since it was still an hour and a half before Daddy would be home. Then we made some tea. Hazel wanted red raspberry (her favorite) and Daddy wanted lavender chamomile. I made a pot of the lavender chamomile and a small amount of the red raspberry (which I added cold water to as well). However, Hazel's looked great in the teacup for Valentine's Day. We lit the candles and set the table in the dining room (after clearing it off) and used our good china (well our good china that can go in the dishwasher). I have a set of good china that I was given from a friend--it was her wedding china that she bought from an elderly couple on her honeymoon. Each piece is numbered and has a gold rim so it is hand wash only and I didn't dare let Hazel use it yet. My Lenox set is replaceable so we used that. 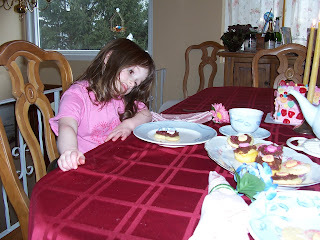 One of the bonuses to having the tea party with the good china and in the dining room is we were more aware of behavior and worked on it a bit more. Steve thinks we should do this much more often, but for now I'm going to commit to every Valentine's Day. It is such a nice way to have some together time that is fun. I got Hazel to let me put the barrette in her hair only long enough to get a picture and even with that it involved crying. The colors definitely got better with more time. Even the orange is starting to show. The purple not so much besides looking a bit blue along the edge. Hazel in her doily stenciled t-shirt. I had mine on too, but didn't get a picture of both of us. Hope you had a lovely day!! I LOVE it! So sweet and simple and memory making! 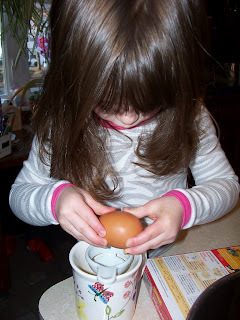 These are the fun little things that your daughter will have fond memories of! Good for you! Sounds like a nice day, and a fun tea party. I just love that you let your daughter help out with the baking and frosting how fun! What a wonderfully special day! I love Hazel's quote when she opened the box! 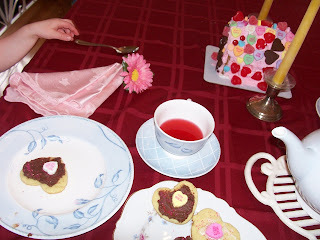 We normally only have pretend tea parties but you have inspired me to have a real one with the kids :-) And of course, thank you for sharing at Happy lil ❤'s are baking! Aw! So fun! And look at those adorable cupcakes! Thanks for linking up at S.O.F.! I love that! What a nice Valentine's tradition that will be! Your tea party sounds so wonderful! 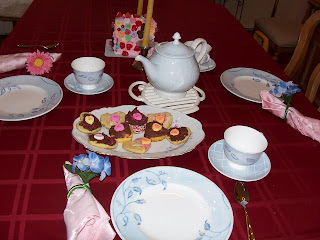 I love that you have real tea parties, we tend to just have pretend ones - but I think we will be following your lead :-) And I hope Steve had a great birthday!! And thanks for sharing on Happy lil ❤'s are baking! So sweet! 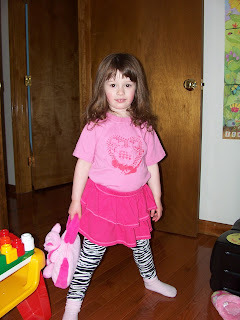 Your daughter looks like she is having fun :) Thanks so much for sharing at Taking A Timeout Thursday!